You´re about to read the second out of nine reviews. You don´t need to read them all, just pick the unit that seems to be the most interesting to you. In the weeks to follow I´ll review the following units: Kenwood DP-5090, Pioneer DV-610, Sony CDP-470, Pioneer BDP-140, iRiver IMP-550, Sony MZ-R 55, Sony MZ-R 37, Sony NW-A 1000 and the Sansa Clip+. 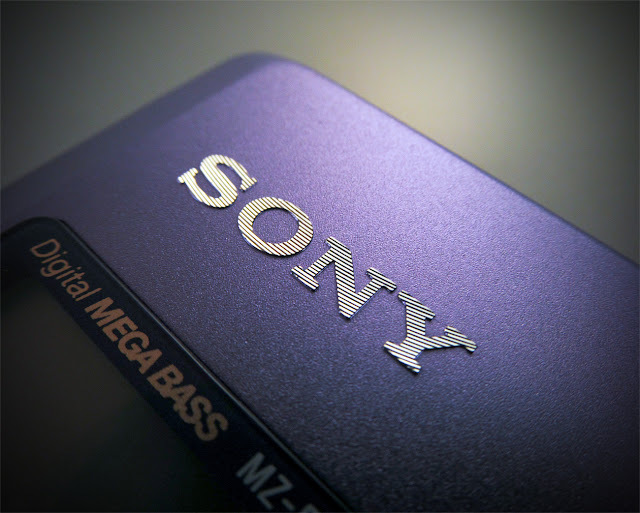 Stay tuned and enjoy the second review, the Sony MZ-R 55! I also implore you to read the article describing my rigorous testing methodology before you actually start reading this one. The Sony MZ-R 55 was released to the market in 1998, it was the direct successor to the very famous and reliable Sony MZ-R 50. Both players have many things in common, they each share roughly half of the same parts. Sony reorganized the mainboard design for the MZ-R 55 in order for it to be much smaller, they also altered the power supply so that it would work fine with 3 Volts only. But both players still carry many of the genes from the Sony MZ-R 30. In fact, the MZ-R 50 carried over much of the same parts from the MZ-R 30, only the laser, the drive mechanism (smaller) and the amount of RAM were different. The MZ-R 55 continued that scheme and shrinked the MZ-R 50 drive mechanism further (retaining the high quality laser with its die-cast frame). 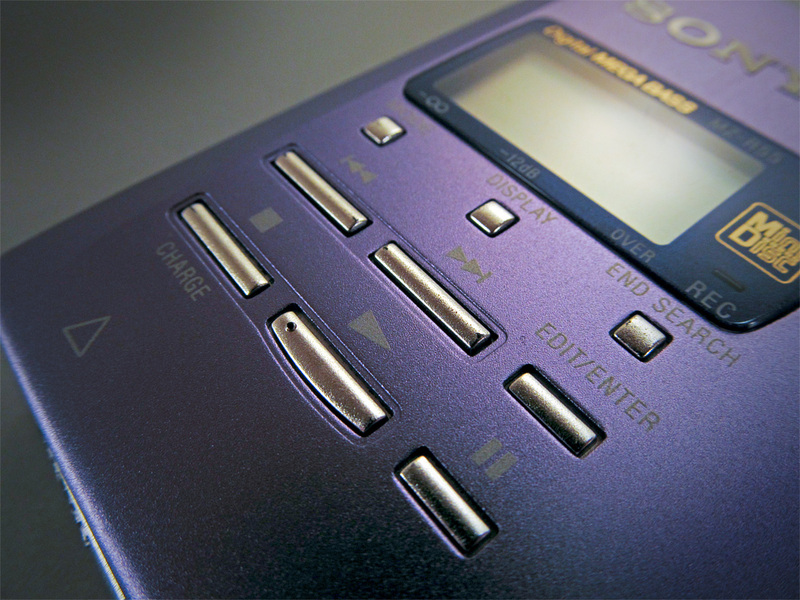 Sony also changed the headphone amp, the A/D/D/A converter (AK-4517) and drive related ICs. The amount of parts however remained the same with the result that the MZ-R 55 has a tightly packed PCB filled to the brink with parts using all available space inside the small shell. When new it cost around 350,- Euros which is a lot considering it can only record and play MiniDiscs. While the MZ-R 30 and the MZ-R 50 are famous for their reliability the MZ-R 55 is not 'cause it has a reputation for being extremely vulnerable to anything out of the ordinary. 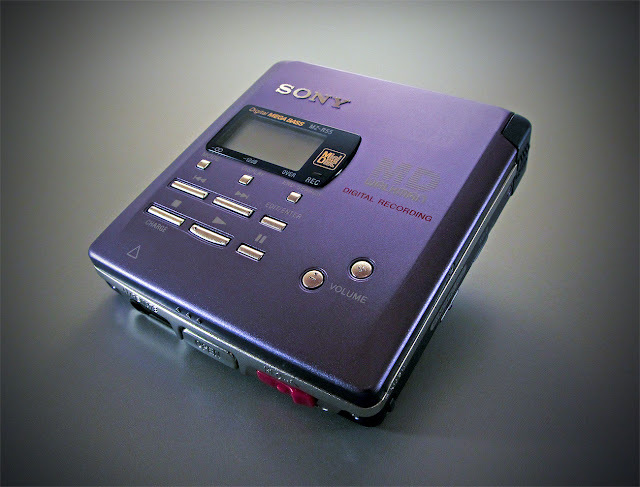 For example David Popovits wrote at Minidisc.org: "A small machine. It looks nice but nothing more. Press stop and in many cases it will start recording. Leave a recorded, unprotected, disc inside the MD during charging and you may find the disc was erased. Drop the machine from a few inches and it will stop recording completely. Use a non-exact power source and it will die partially or completely. Press a bit too hard on the keys and the whole cover will bend. How can we take such a creature seriously?" I don´t want to disagree with David, he seems to be a very experienced fella. Nevertheless I do have a different opinion (until mine will break of course). Its outer metal shell looks exquisite and while it doesn´t seem to be as thick as the one from my MZ-R 30 it nevertheless feels heavy and luxurious. The finish of its entrails looks marvellous too, its drive seems as if built to last forever. 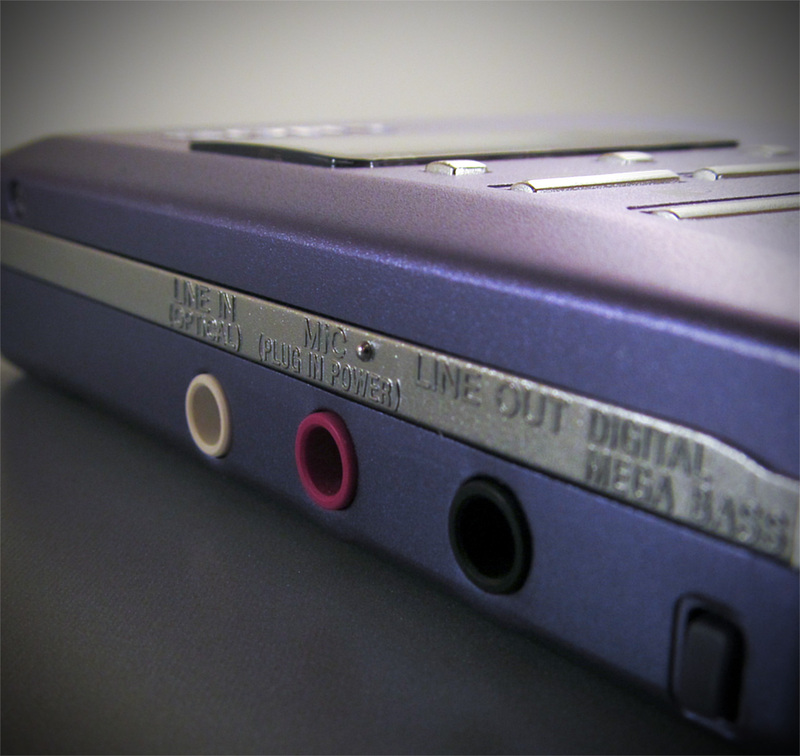 The mechanics are also one of the most quiet I´ve heard from an MD recorder... lovely. I would have loved to own the silver/gold version but I´m very happy with its lilac colour scheme too (remember: in Japan this colour is associated with wealth and power; go figure). It looks and feels like a very expensive and heavy cigarette case, albeit one with a conservative purple design. I really enjoy holding it in my hands, to touch it, to press its buttons, to open its lid... ah yes, opening the lid feels great. 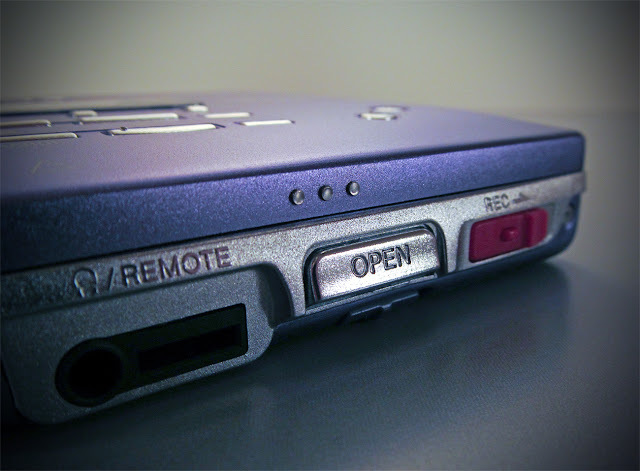 It doesn´t really pop open with a loud crash like on the MZ-R 30, it just clicks open and you then have to apply slight force so that it finally opens with a soft slide. Boy, I could open and close the lid the whole day! 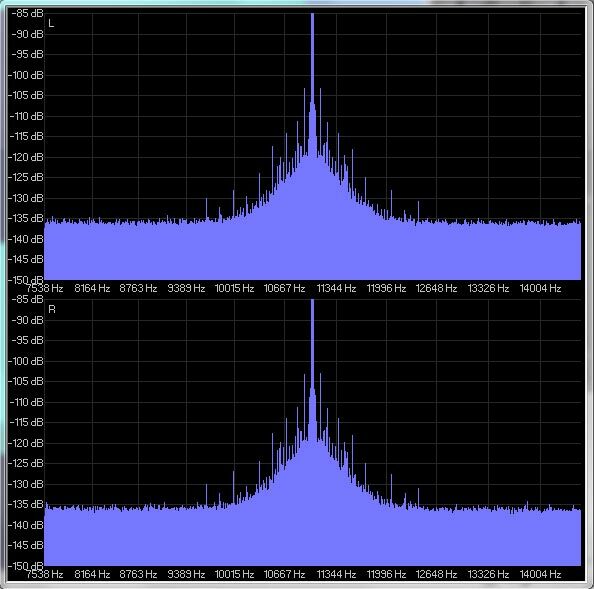 Apparently it doesn´t have high frequency jitter, only the spread around the base sine indicates some slight low frequency jitter; this might be audible since some peaks are just below -100 dB. The RMAA chart reveals that it is relatively noisy and also has slight problems with distortions (except IMD, those are non-existent). Its sound is... well, very good. The only real problem of the MZ-R 55 is the timidness of the bass, punches at lower frequencies loose their might and impact. Apart from that it´s very balanced, retains much of the character from the reference files and shows a similar level of resolution and definition. Details are never smeared or lost, they show an articulation close to the source. Its dynamic problems do not extend to mids and treble, at these bands it almost sounds like the reference. The stage is way too compact but presents an incredibly holographic depth with lots of focus and an excellent sense of space: far from being a close match but an elegant deviation. Fairly well done, Sony!